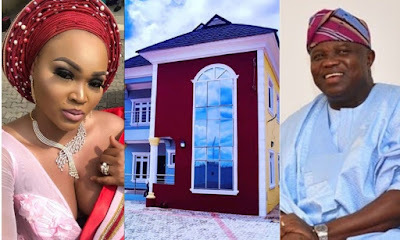 Nollywood news + Naija Gist | Yoruba movies, Naijagist, Nigerian music, Naija news, Nigerian movies: Mercy Aigbe finally respond to news about Ambode buying her a house. Mercy Aigbe finally respond to news about Ambode buying her a house. “Dear Bloggers, the mumu upcoming script writer! and association of instablog bad belle, jobless commentators….this house you see in this picture was bought with my hard work and God’s grace……..since you have taken it upon yourselves to be in my business, pls employ a very good private investigator, a pastor, an Alfa or a Babalawo to help you in further investigations….so you won’t be peddling stupid rumours that has no iota of truth in it!….let me quickly warn you that more is coming oh!!! What till you see what is next!…..